We are fully into the sleepover stage, so much so that we got rid of Sojo's mammoth bed and traded it for a smaller, new-to-us daybed with a trundle that is perfect for sleepovers. And it is almost exactly like her bed in our Port Townsend house. We set it up today as the two kiddos were downstairs playing, and I was told there was some serious squealing when they saw them ready to go. Don't be fooled for a minute--they are not actually in bed at this moment as this photo would suggest. As I write this at 9:30 p.m., I can hear Legos clicking together and something banging upstairs, and I'm sure they are in the midst of some elaborate game. * We are on a 2 week vacation (actually, Dale and I are working the first week, but Sojo is off school), and there are not one, but TWO sleepovers planned for this week. Sojo: You know in that movie Rio, the message is really all about freedom. E: I know. I mean, you have to let something go to make it free. Deep thoughts from 7 year old buddies. The conviction in their voices was so sweet. Sojo moves at her own pace with many things in life, but when she decides to do it, it's for real. Giving up the bottle, potty training and now riding a bike---all things she took her own sweet time doing. For so long now, she has had zero interest in riding a bike, but a friend was selling a cool one that we knew she would dig, so we brought it home and kind of announced that it was time to learn to ride a bike. Dale, as always, was a super dad, running alongside her and encouraging her all the way. She was getting the hang of it, though she was still a bit rough on turning. Her best buddy was with her the whole time, riding beside her and telling her she was doing great. 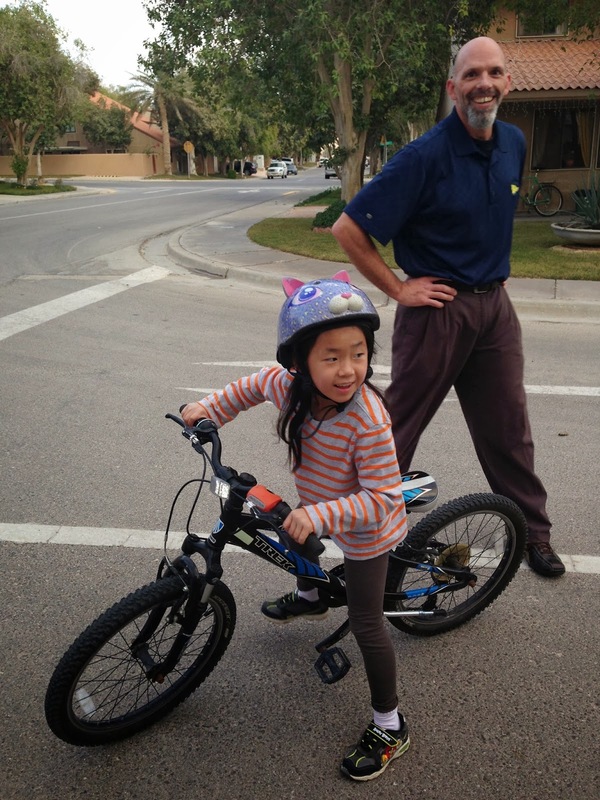 It was super sweet, and she was getting the hang of it enough to even ride to school, albeit with worried parents walking at a brisk pace to keep up with her wobbliness. And then she broke her ankle and was off the bike for more than a month. I wondered if she would lose interest again, but I was so wrong. She's back on it with a passion I've not seen since she started scootering years ago in our dining room in Thailand. It's all bike all the time here, and she claims that breaking her ankle actually helped her become a better rider. As her mama, it's so darn cute to see her black ponytail in the wind as she takes off down the street. I do fear one day she'll tell me she ran into someone's car as she's still a bit reckless on her turns, but she's doing great and feeling on top of the world. So much so that every time she rides, she has this huge grin on her face. I know that thrill of the newness will fade, but I love the sheer joy at this moment in time. I've been wanting to do a sprint triathlon since I moved to Saudi last year. We have a very active and fabulous fitness group that is super supportive, so I knew that this would be the place to jump into this kind of challenge and feel great about however I finished. Mind you, the word 'sprint tri' sound like it's a triathlon but faster, but it's really a shorter distance of 500 meter swim, 20K bike ride and a 5K run. Shorter distance but still FAR!! 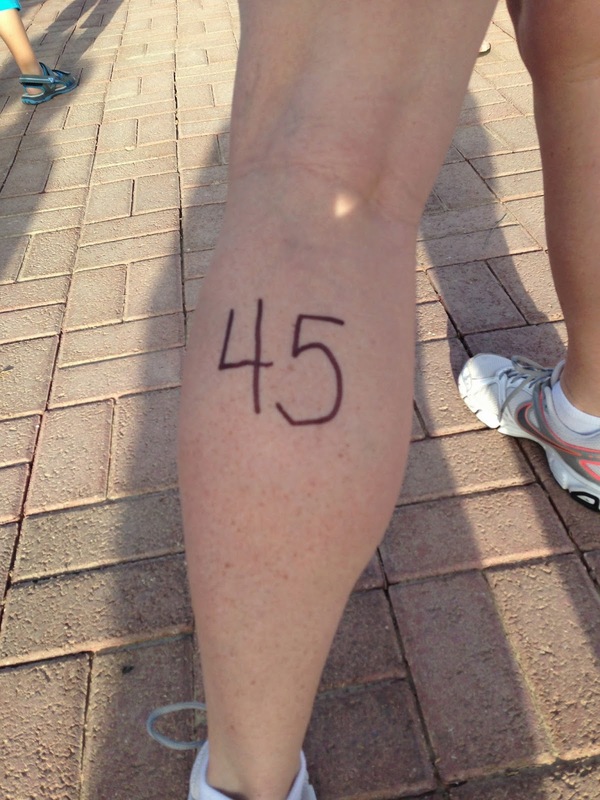 But I was pumped, and I love the near rhyme of "sprint tri @ 45," so I knew this was the year to do it. I trained enough to let myself know I could finish it, and it worked in my favor that swimming is my strongest of the three events since it gave me to confidence to get out of the pool fast and onto my slower events of biking and running. There was a guy taking photos with a really nice camera during the swim, and more than once, I came up for air to find the lens close enough to my face to feel like an Olympian. This is my favorite shot. I finished the whole race in 1 hour and 40 minutes, which was incredible to me. Just incredible. And the concept of a sprint tri was so much fun that I can't wait until the next one. I even find myself thinking about it at random times now--wanting to improve my biking time (darn those hills for slowing me down!) and finding a way to have extra energy for the final run when I'm wiped out. I love becoming an athlete. Finally...the cast is off, and she is on the move again. So happy to be able to get her outside moving around rather than on the couch for the last month taking it easy! 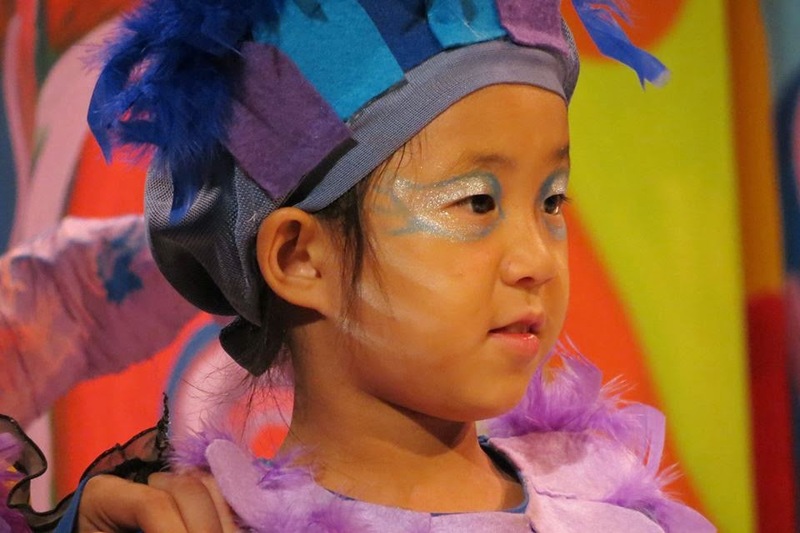 Sojo tried out for the elementary play this year, and she got the part of 'baby pigeon.' Although going to practice during her normal play time was very challenging for her, she did it and was so amazing on stage. She was smiling the whole time and had memorized everyone's lines. Just as fabulous as being in the play was the visit of popo and gong gong to see her in the play. Living overseas means that grandparents miss out on those little (big) things like plays and soccer practice and such, so we thought this would be a fabulous idea. And it was--it was a crazy week with play practice and school going on, and they didn't see much of Saudi, but we loved every second of having them here! We were able to take them to Sojo's favorite country in the world, Bahrain, as they flew out of there. Not sure they understood fully why it is so fabulous as we spent the whole day in the mall, but they were good sports and followed Sojo along as she showed them all her favorite things.